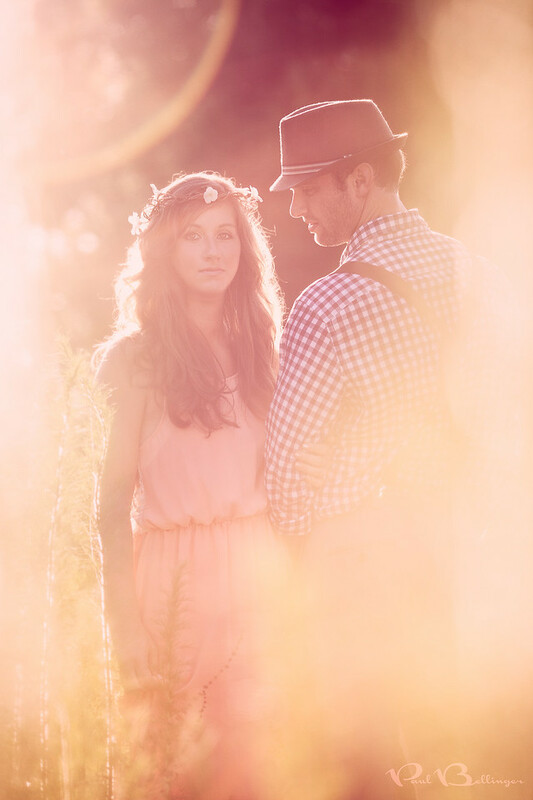 In this photo, all of the lens flare is real and I did some minor processing in Photoshop to add contrast, color and to bring the couple out. The bright light on the far left and right of the frame are pieces of long grass/some other vegetation in the foreground. I love to use foreground objects to frame my subjects. I took about five or ten shots from this grassy perspective with tons of flare, but also took several of the standard straight on, no foreground, minimal flare shots too. The grassy flare shots may not be as technically perfect, but to me they are better at conveying the dreamy fantasy mood I’m always looking for, and the lighting is certainly more dramatic. So that’s my vision. Getting the camera to focus while shooting into the sun with stuff in your foreground and loads of sweat in your eye and on your glasses/viewfinder is a whole different story!